Three new publications to be super stoked about! Once again, Mike Taylor delivers an incredible new issue of Late Era Clash, Aimee Lusty created the best graphite drawings of antiquities and absurdities found on Ebay (Down By The Bay), and I finally compiled five years of Paquita Calendars into one book (The Time Is Now). You can get all three in a package deal for one low price via Etsy, or on their own in either Pegacorn Press store (Etsy or Storenvy). If you're interested in carrying these titles at your store and have a Last Gasp account, feel free to do bulk orders from them! Come celebrate some new Pegacorn Press publications with us on Saturday night at Booklyn! Down By The Bay (Aimee Lusty), Late Era Clash #26 (Mike Taylor) and The Time Is Now (Caroline Paquita) will all be unleashed to the public. A box set featuring every publication made and/or produced by Paquita (since high school, aka, the 1990's!!! 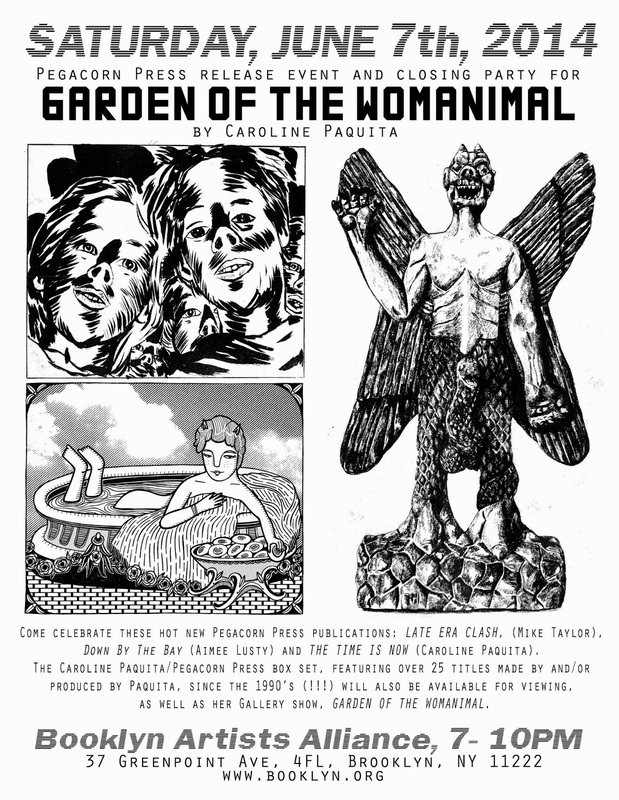 ), will be available to check out, as well as the exhibition, GARDEN OF THE WOMANIMAL which ends the following day. It's definitely a meta-event of all things print related!